I received some darling stamps from my friend Stephanie at Clearly Besotted Stamps – and the sets (Stitched Mittens and Laugh out Loud) have lots of small images. That made them PERFECT for trying out watercoloring on black cardstock with Finetec paints! I’ve showed you the set of 6 golds and pearls before, but there’s a sweet set of 12 that’s got some interesting colors in it that you might find tantalizing. Watch the video below, or click HERE to watch in HD on YouTube! Wasn’t that fun? Remember to be careful about how much water you use on the black cardstock; the Bazzill worked, but with some warping. It wasn’t really bad, and flattened out easily by pressing it in a book overnight. But run some tests on your paper to see just how much water you can get away with first. There’s a set of 6 gold paints (with larger pans than the set of 12) that would also work well – and those paints even come in single pans, too, so you could try out just one or two if you wanted. 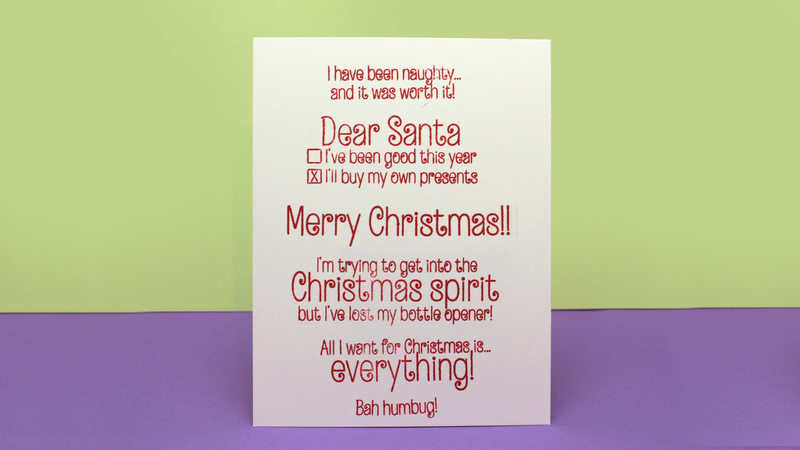 The Laugh out Loud stamp set has some pretty funny sentiments in it….LOL! I’ve been invited to contribute to a new card class coming up – Tried and True…all about card designs that work! There’s a fun bunch of ladies participating – and it’ll run through the month of November. Check it out here! This is beautiful. Thank you for showcasing this technique, I love it! Absolutely beautiful cards! Love the black with pops of color. Beautiful card! Love the paint on the black card! Too bad the Misti is made in China…I’ll pass on that one. Here’s another one of your fabulous designs and coloring with much interest and originality! Toot Toot, Kudos! I have the Finetec golds and just love them. Did not know they came in colors. These are a must have for me. Those paints look amazing on black cardstock! Love this look, Sandy! Just a hint about embossing white on black – if you heat the back of the cardstock before applying heat to the front, it will “set” the embossing powder so that you don’t get the little white flecks that blow off when you direct the heat gun at the images. Love the great look of the watercolor on black. That bit of shimmer is great and love you did not let a few specks of errant embossing stop you. Like the dots of white ink. Great job…thanks for sharing. Thank you for showing us the difference between the original MISTIs and the newer ones. Beautiful cards! These are Gorgeous!! Love the sayings in that set, too FUNNY!!! You give such great tips – I don’t want to miss any video or post! Thank you so much for sharing. 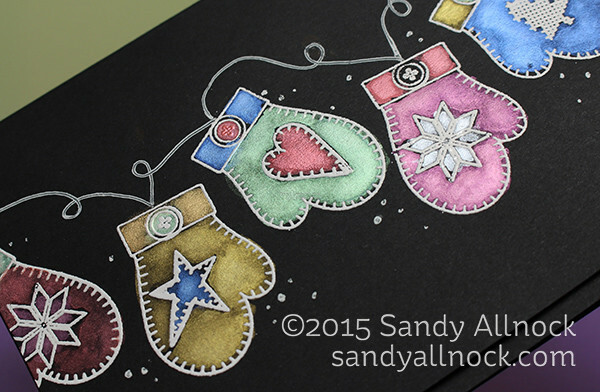 How I love the pop of color on the black cardstock! Great designs for both cards. What great cards. Thanks for all your ideas, you are helping me become a better card artist. Your stamping and embossing skillz are great in these cards. I always struggle with embossing on black paper, but I love how it looks! Thanks for sharing a “not traditionally red and green” set of Christmas cards with us! Oh my….you just keep enabling.